Clear Scalp & Hair Beauty Therapy is a brand that I have heard and seen in TV ads and magazines, though I never really had the chance to give it a go. Miranda Kerr is the brand ambassador for Clear Scalp & Hair Beauty Therapy and it's no wonder why her locks are as healthy and shiny as can be! Clear Scalp & Hair Beauty Therapy products are infused with Nutrium10TM technology which consists of a rich blend of vitamins and nutrients which help to nourish the scalp. Providing and feeding your scalp with nutrients and vitamins are the basis for strong, beautiful and shiny hair. 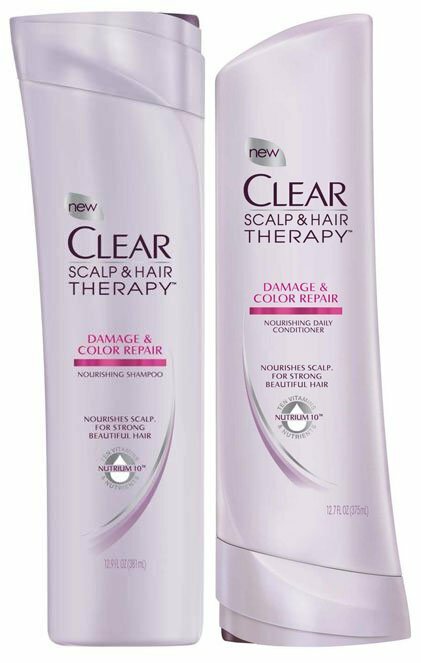 A few weeks ago, I was invited to trial the Clear Scalp & Hair Beauty Therapy shampoo and conditioner (A$5.99/200ml or A$9.49/350ml each) and was thereafter sent products from the Damage & Colour Repair Range to try. The Damage & Colour Repair Range is formulated to treat and repair damaged and coloured hair. The formula is colour-safe, which does not fade colour-dyed hair and aims to nourish damaged hair and provide protection to improve the health of hair. My long thick hair was in dire need of nourishment and strength, as I've been meaning to let my hair grow long. Over the last four weeks, I've been using the Shampoo and Conditioner from the Damage & Colour Repair Range and I must say that my hair has been looking great! After the first week of using the Shampoo and Conditioner, my hair not only looked healthy, but felt silky smooth and well nourished. The Shampoo is a pearlescent white formula which lathers up well, thoroughly cleanses my hair and nourishes my scalp. The best way to achieve a clean and healthy scalp using these products is to gently massage into the scalp. My hair doesn't feel dry nor weighed down, which is great as my thick hair is already difficult to deal with. The conditioner is an opaque white cream which makes my hair feel silky smooth and I could easily run my fingers through my hair under the shower without any obstructing knots in my hair. The floral scents of these products are light and refreshing! My hair does leave a subtle floral scent while my hair appears healthy from root to tip! Have you tried the Clear Scalp & Hair Beauty Therapy? Which products have you used to treat damaged and colour-dyed hair? *Products were provided for consideration only. These reviews are 100% based on my own thoughts and opinions. I am not affiliated with Clear Scalp & Hair Beauty Therapy and did not receive remuneration to post these product reviews.